Want to improve your manufacturing business? SWFL manufacturers large and small are learning how to use grant money and strategic partnerships to help them increase market share with importing and exporting programs. Looking for local suppliers, vendors, real estate or other manufacturers to partner with? 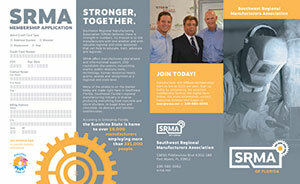 The SRMA is Southwest Florida’s go-to resource for manufacturers. Attend a variety of exclusive SRMA plant tours and seminars geared to help you learn more about the industry best practices that can make you more successful. The SRMA continues to support the STEM initiatives in local schools and businesses to help forge high tech careers right here in Southwest Florida.